Republican Sen. Kelly Ayotte said that healthcare costs would continue to rise under Obamacare after the federal government announced that health insurance premiums are expected to soar next year. The freshman Republican senator from New Hampshire said that the Affordable Care Act, which passed without a single Republican vote, had failed to address rising costs in the healthcare industry, noting that "too many New Hampshire families are struggling with higher deductibles, higher co-pays, higher premiums, less choice." Ayotte offered several reforms that she said would address Obamacare' problems, including allowing insurers to cross state lines to give consumers more options, as well as expanded access to health savings and flexible spending accounts. "I would go for more competition from Washington, not one-size-fits-all. 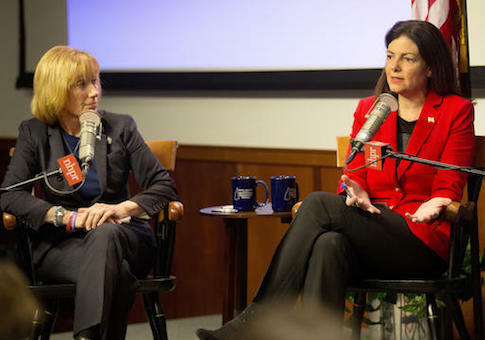 Some more opportunities for different kinds of plans," Ayotte said at the New Hampshire Public Radio debate. "If it is one-size-fits-all from Washington, then that is going to continue to drive up prices." Average premiums increased by 25 percent for those looking to enroll in the Obamacare insurance exchanges. In 2017, consumers will pay on average more than $300 each month to enroll in a plan compared to about $240 in 2016. The announcement comes as the Department of Health and Human Services prepares for its open enrollment period on Nov. 1. "Average [Obamacare] Marketplace premiums for 2017 are increasing more than they have in the past two years," the agency said in a release, as insurance companies grapple with the actual costs of insuring customers enrolled in government-backed plans. It also noted that that New Hampshire was one of 10 states to experience a rate increase below 7 percent. Gov. Maggie Hassan, a two-term Democrat, has made Obamacare a centerpiece to her campaign. She expanded Medicaid access for New Hampshire residents in 2014 and extended the state's participation in the program in March 2016. "It’s clear that expansion is strengthening the health and financial security of our citizens and we know that reauthorization is also critical to our businesses, our economy and the ongoing battle with substance abuse," she said in an April campaign release. Ayotte said that she backs several Obamacare reforms, including protecting coverage for citizens suffering from pre-existing conditions and said that she would allow residents to keep their healthcare plans, including those on Medicaid, if they were satisfied with the results. Ayotte's debate remarks come as New Hampshire Republicans released a new web ad hitting Hassan for supporting "the healthcare law that is hurting New Hampshire families." The ad features testimonials from residents that have seen premiums increase by as much as 47 percent. It also features former president Bill Clinton's recent remarks criticizing Obamacare as "the craziest thing in the world. "Maggie Hassan can’t stand up to her party. She supports the broken healthcare law that even Bill Clinton called ‘the craziest thing in the world,'" the ad says. New Hampshire is one of the most competitive races in the country and could determine the Senate majority in 2017. A UMASS/WBZ poll released Tuesday showed that Ayotte had taken a four-point lead over Hassan. The race remains a statistical tie with Hassan up by less than 1 percent, according to a Real Clear Politics polling average. This entry was posted in Politics and tagged 2016 Election, Kelly Ayotte, Maggie Hassan, Obamacare. Bookmark the permalink.